Milk Made For Silky Skin by GONE! I love how this product looks, feels and works, but I can't help be disappointed with a scent that is nothing at all like the body wash I've come to love. Since EF no longer carries it, this might be a moot point, however. This thick body butter is great for slathering on hand sand feet before bed. It's whipped formula moisturizes well; although, you might find it heavy for daily use or on your hands in general, however. What I love best about this product is the texture. It's thick and whipped. How thick? You can take the cover off, turn it upside down and shake it without any product falling out. It's whipped, so the tub makes the best container for administering the lotion. The lotion didn't even seem to move much during shipping, which is great. Although it's sealed, it's still frustrating to remove that seal and have everything drip all over the place. When you put this on your skin, it stays put and feels moist but not greasy, which I like. It doesn't seem to just slide over the skin like some lower-quality skin products, either. You may need to rub it in a little longer because of the thick texture, but I don't personally mind. Not that this product can make your hands slippery so putting the cap back on might take a try or two. This body butter is part of the Milk Made line. I've used other products, and they're supposed to smell like vanilla and raspberry. The body wash is the best example of this scent. It's very sweet and feminine, but you might find it a little unsophisticated. It reminds me of a mix of vanilla and Bath and Body Work's "Sun-kissed Raspberry" -- and much sweeter than you could imagine. I love sweet so I was hoping this product would be as sweet; although, I tried the hand cream and it didn't smell the same. Unfortunately, the same rings true for the body butter. It's less sweet, has a powdery smell and the scent of cosmetic ingredients is strong. I get a whiff of something almost like I'm expecting, but the powdery cosmetic smell is overwhelming at first. I don't like to indulge in the aroma like I do the body wash, nor do I find this really complements the body wash because of it. However, this fades over time. If I put my nose to my skin, I'll smell it, but it's not so strong that I am constantly bombarded by a scent that I don't like. Because of this, I'll keep using it. I did not taste this because lotions are not fun on the tongue but I imagine it would taste cosmetic-like, too. I do like this as a lotion. It's not the thickest, but it's thick enough to work well. I've used it on my hands, arms, legs and feet to find noticeable increase in softness afterward. In these dry, winter months, I really can use moisturizing, and while my skin may not stay as moist as I'd love during this part of the year, Cake's body butter does help a lot. I would probably need to put it on two or three times per day to really get that constant moisture. The lotion doesn't slide over your skin, as I mentioned. This is one of my pet peeves: when lotion just pushes around. It does absorb, and it stays on your skin through at least one hand washing, which is good. The packaging is a simple tub. It comes with a seal on it under the cap. This seal is just wider than the rim and has no pull tab, so I had to take a knife to cut into it and cut a circle of seal out at the rim. It's a bit annoying but not a deal-breaker if you like the product. The pink and white theme is cute and matches the rest of the Milk Made products. It's a bit large for travel or carrying in your purse, so I'd keep this in the bedroom or bathroom only. The tub securely holds the body butter, and there's nothing adult about it. It's wide enough that I will always need two hands to open it, but mine are small. Your mileage may vary. As far as application goes, you must stick your fingers in and scoop it out. If you estimate how much you need well, this works. However, controlled amounts helps make sure you don't wind up with a mess. A small spoon or other scoop might make this easier, but I don't think it's necessary. I wouldn't give this to someone without extra wrapping. However, this lotion doesn't contain potential allergens such as parabens, sodium chloride, phthalates, GMO's, mineral oil, petrolatum, gluten or triclosan. Cake is a Canadian company that uses a cold processed formula to cut down energy and heat use. I always feel good when I purchase from this brand. Great review! Disappointing that a bunch of the Cake items are discontinued. So wanted to wishlist this! I don't know if EF is getting rid of this brand, but there are other products I definitely wanted to try. sigh. Does this make you feel oily? 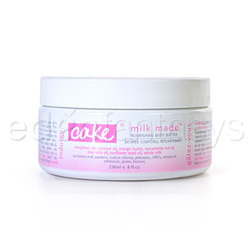 Thank you for viewing Milk made nourishing body butter – body moisturizer review page!